Pinellas County beachgoers should keep their beach plans intact this weekend amid the red tide outbreak, but next week could prove more concerning. ST. PETERSBURG, Fla. — Red tide is forecast to move southward along Florida's Gulf coast this weekend, likely keeping those Pinellas County beach plans a-OK -- for now. To repeat a broken record: The toxic algae bloom ravaging parts of Manatee and Sarasota counties is expected to continue, according to the latest forecast maps provided by the University of South Florida. High concentrations of red tide persist, killing thousands of fish, manatees and sea turtles. Nine dolphins have been found dead since last weekend, but necropsies on the animals have not yet concluded red tide as the cause of death. 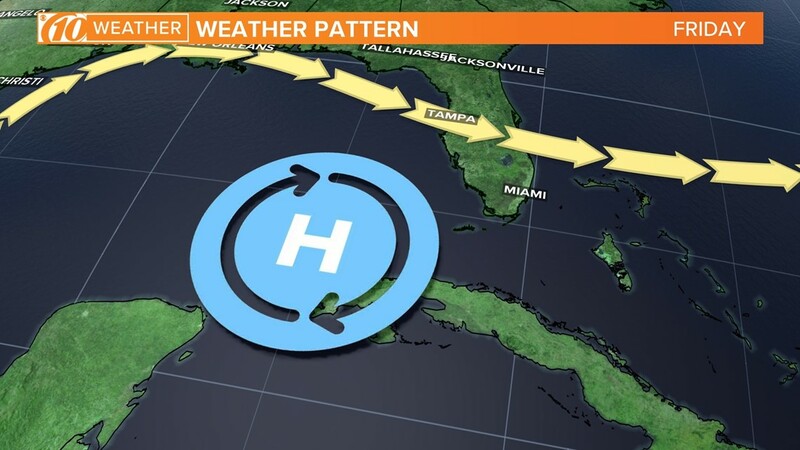 NOAA's National Ocean Service reports similar, mild respiratory issues could occur for people boating off the Pinellas County coast, with more intense symptoms likely southward. Although Pinellas County so far has escaped the worst of red tide impacts, that might change early next week. 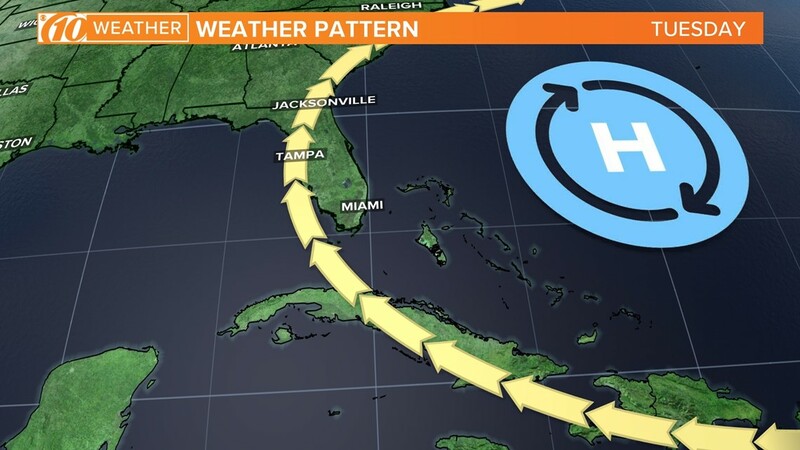 A high-pressure system keeping a dominating, west-northwest wind is forecast to transition into a stronger area over the Atlantic Ocean. Those favorable winds are expected to change, too, with a general flow coming out the south-southwest. This could push the area of red tide closer or into areas that have yet to experience higher concentrations. The general wind direction Friday, Aug. 10, is an onshore flow, keeping red tide contained to its current location. Winds are expected to begin shifting during the weekend. 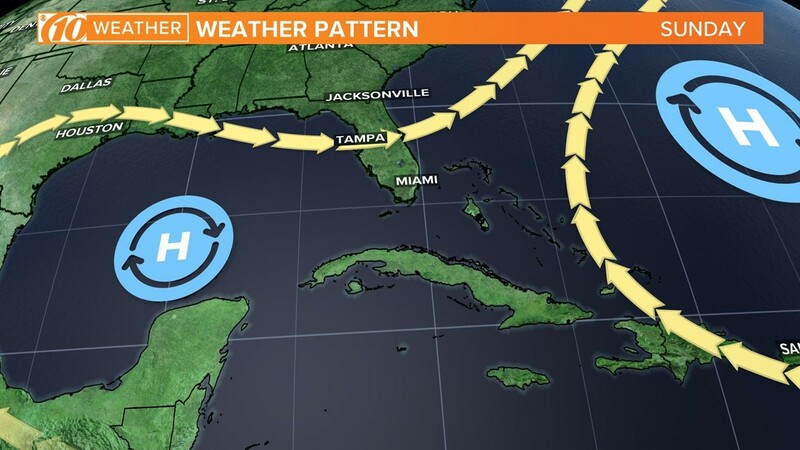 The dominate wind flow early next week is forecast to come from the south-southwest, possibly pushing the higher concentrations of red tide into areas that have yet to experience it. You might've heard the rumor that this red tide is going to stick around until January of 2019. FWC says it’s way too early to tell if that’s true. It can only forecast up to three days out, based on the wind and currents.